To mark the exhibition of the Oramics machine at The Science Museum, this month's The Wire contains an article I wrote on the little-known esoteric interests of Daphne Oram. This represents, it seems, the most extensive examination of this aspect of Oram's work in print at present. 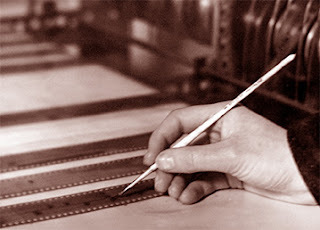 Daphne Oram was a true pioneer in experimental and electronic music - she is known principally for her establishing of the BBC Radiophonic Workshop and her subsequent development of Oramics (a technique of crafting electronic music by hand-drawn notation). What is not generally known is that Oramics refers not solely to the drawn sound technique, but also to a wider philosophy of sound - a holistic approach to studying all vibrational phenomena and their relationship to human life. Part of the reason for the obscurity of this phase of Oramics may be in part due to the general scarcity of the only book she published - her groundbreaking 'An Individual Note of Music, Sound and Electronics' (1972). In the early 1980s Daphne was preparing another book, this time on ancient acoustics - a field of study known today as archaeoacoustics (the most notable recent study being 'Archaeoacoustics' published by McDonald Institute in 2006). If her manuscript, 'The Sound of the Past', had been expanded and published in book form, it would have marked yet another pioneering achievement. Sadly, lack of matched impedances prevented this being realised. 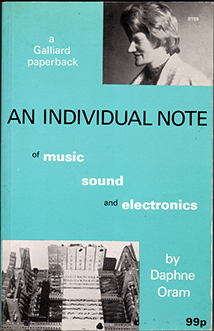 However, this short unfinished text will soon be available on the Daphne Oram website. In 'An Individual Note', Oram places emphasis on the joy of musing - "on sniffing the air" and "catching scents". She says, "if the scents lead me sometimes 'up the garden path', I still enormously enjoy catching them". In time, science may go some way to verify some of Oram's more radical speculations (particularly those in her unpublished notes). For instance, the behaviour of the human organism in response to geomagnetic wave phenomena is taken more seriously now than in previous decades. These zones of thought on the periphery between knowledge and mystery are also where profoundly fascinating insights take place, with accompanying inspirations. And such inspiration is, after all, fine fuel for artistic creative endeavours. Acupuncture, astrology, ancient resonances of Egypt's Great Pyramid and Britain's dolmens and barrows, John Erskine Malcolm's curious theory of systemic arterial resonance.... Read about all this (and more) in this month's The Wire, issue 330... because it's extremely difficult to condense all this into a single blog post. Congrats on the article. Good work!